I love bananas and romaine, but usually I have it in either a fresh organic smoothie or as a sandwich (large leaf of romaine with a peeled banana inside). 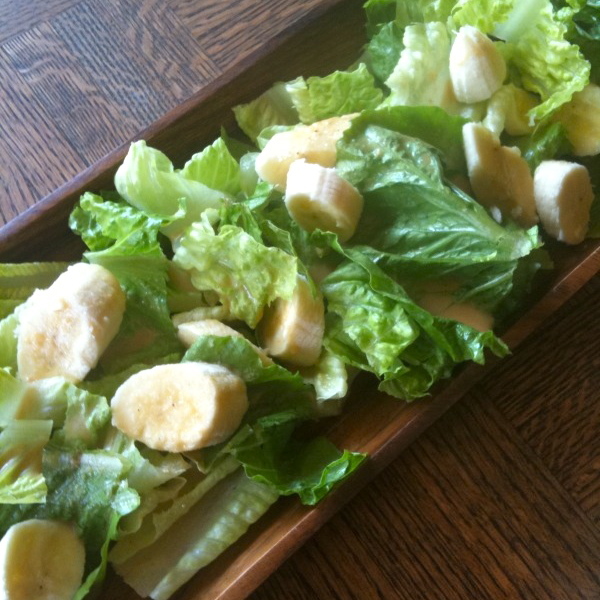 But, today, I thought to myself… I want a big fresh romaine salad and what better topping to put on it than BANANAS!!! I know it might seem weird to have sliced bananas on a salad, but heck, we often add mango, apples, berries, and other fruits to salad. I thought… why not bananas? Then, I added my Ginger Shallot Dressing to it. OMG – SO YUM! I will be having this combination a lot more in the future. A LOT MORE! Plus, it’s so easy – romaine, bananas, and simple dressing. Don’t you just love easy and fresh and delicious raw recipes that fill you up with energy?! Speaking of Ginger Shallot Dressing… it’s going to be available in my new book, Kristen Suzanne’s EASY Raw Vegan Transition Recipes, which is going to be available SOON! The update: the book is out of my hands now. It’s going through the distribution process and I’m told it’ll show up on Amazon anytime in the next 1-3 weeks.